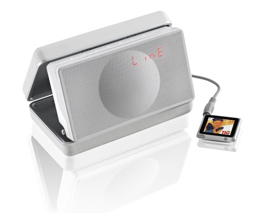 All about the new Geneva Labs Model XS portable sound system at Totally Wired. 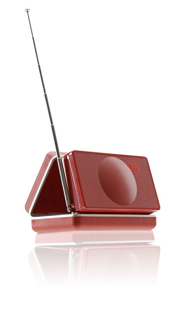 The innovative new Model XS from Geneva Lab is the ultimate compact and portable Hi-Fi system. But it's not just for travellers - the Geneva XS (that's eXtra Small) is also perfect as a bedside radio and music player for stay-at-homes. Covet it as a designer must-have, give it as a carefully chosen gift, or just enjoy it for the excellent sound and innovative features. Whatever the motivation for wanting the newest model from Geneva, you'll find it's a small package with big surprises. The first being the sound quality. Regardless of how cool it looks, how sharp the combination of technology and price, the Geneva XS is made to be listened to and the good news is that it really does perform. My first exposure to a working unit playing music (wirelessly from an iPad via Bluetooth) brought an immediate smile - it's at least the equal of the highly regarded Tivoli PAL radio which is really saying something. The XS packs the technology in. Featuring a high fidelity stereo speaker system with integrated subwoofer, patented amplifier and DSP technologies the Model XS produces a truly remakable, full scale sound output from a unit compact enough to slip into your carry-on luggage. As you have picked up, the Model XS includes Bluetooth® for connection to a multitude of portable devices including laptops, iPads, mobile phones (including iPhone) & mp3 players so you can listen to your own tunes wirelessly. What impressed me was that my friend Mike took his iPad out of the room while the XS was playing a song from it - and it just kept streaming along without interruption.The built-in rechargeable lithium battery gives the XS around 5 hours of portable playback time and it can also be mains powered with the included wall charger. The Model XS features an easy-set digital alarm clock FM radio with a long life battery backup* so you can rest assured you will wake up when you need to. *The clock can run for 7 days with the case open without a recharge; closed the clock will keep time for one year without a recharge. Inspired by the classic travel clock the Model XS is housed in a fold-up leather style case sturdy enough to take punishment from even the most seasoned travellers. 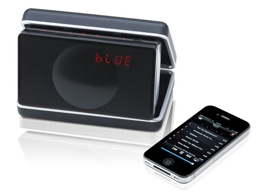 The case opens up to reveal Hi-Fi quality speakers and intuitive touchlight® controls. You have the choice of black, white and red finishes. Email or call us on 0800 909 101 call us to order your new Geneva now. Let us know if it's a present and we'll giftwrap for free! The new Model XS is just the start of the Geneva Labs range. The Model S is a larger table top model which your iPod docks directly into. The Model M is even better again and rivals many conventional stereo systems. Learn about the full range here.